RV Tire Safety: What is a good tire gauge? You need a system, as any gauge can be damaged or fail. Over the past six years I have offered pressure gauge calibration check services. With well over 70 gauges of almost every description checked we have learned that many are not much better than door stops or for use as a tent peg. There are some broad generalities we have learned. are usually the most repeatable and accurate with dial gauges. or "pencil" gauges lagging far behind. While it is also true that I have found some gauges of each type to be accurate, those tend to be those that are brand new. The stick gauges with the sliding bar tend to get worse with age. This is probably due to dirt and nicks in the slide stick causing inconsistent and inaccurate readings. Before I get into my suggested "system" some are probably wondering how I can be confident that my master gauge is itself accurate. Having worked as an ISO 9001 certification auditor, it was part of my job to understand how to establish systems and procedures that when followed could be relied upon to deliver accurate information. Even though I am retired, I still can gain access to tire laboratory test equipment and occasionally compare my gauges to current ISO certified laboratory gauges. System: You need at least two gauges. One is your own personal "Master Gauge". This gauge is not used to check the pressure in your tires. It is only used as a reference for your regular use hand gauge. The Master gauge should never be stored in your tool box but should be carefully packed away where it will not get dirty, wet, dropped or knocked around. Calibration check procedure: Using one of your front tires as a source of high pressure air you would take a reading with your Master gauge and a reading with your hand gauge. Hopefully when you first set up your system they will both read within 1.0 psi of each other or better. If not you may want to check your gauges against other digital gauges to try and confirm if it is your master or hand gauge that is most accurate. Majority wins if you have two that match to within 0.5 psi. For your two gauges you should record the two pressure readings and the date. You can then take readings of all your tires using your hand gauge, recording the pressures as you go. 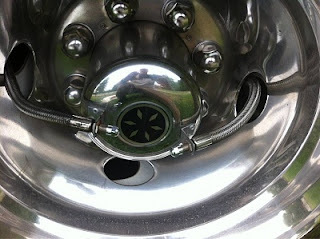 You could also record the readings of pressure from your TPMS (tire pressure monitoring system). Now I would expect the TPMS readings to be within +/- 3 psi of your hand gauge. Remember, TPMS are primarily a tool to warn when there is a change not to be used as an absolute accurate gauge. Again record the measured pressures. Once you have finished this initial check you can set your tires to their appropriate Cold Inflation Pressure (CIP) level using your hand gauge. Now when you look at your morning TPMS CIP readings, you should see similar movement up or down of the pressure of all tires as daily morning ambient temperature changes. Remember the tire pressure will change by about 2% for each change of 10F ambient. I covered this change is THESE posts. As time goes on you might see a slow decrease in pressure. This is due to air permeation through the tire carcass and O rings around the valve and TPMS sensor. Eventually after losing about 5 psi you should "top off" the tire pressure. At that time you would use your hand gauge to set the tire pressures. I would suggest that before setting the tire pressures you again do a gauge comparison to learn if there has been any change in the accuracy of your hand gauge. If the difference between the two gauges has changed then you need to learn why. Reliability: It is very unlikely that both your master gauge and your hand gauge would both go out of calibration by the same amount and in the same direction at the same time. Digital Tire Pressure Gauge that I bought from Amazon for $12 as my master gauge. (Note I confirmed this gauge is off by 0.5 psi.) I also use one as my hand gauge (seen above). Since this gauge does not have a truck "dual foot"
head I also run hose extenders on my rear duals. I also bought a Tire Traker TPMS. I have not had any leaking problems as I check the valve stems, TPMS sensor and hose fittings with a spray of soapy water to ensure there are no leaks. Some may want to save $12 and not bother with having a master they can trust. But I don't think it's too hard to imagine a gauge reading a bit higher with time as the internal springs lose strength, so you would get misleading high readings which means your pressure is actually lower. This can lead to a failure that will cost a lot more than $12.